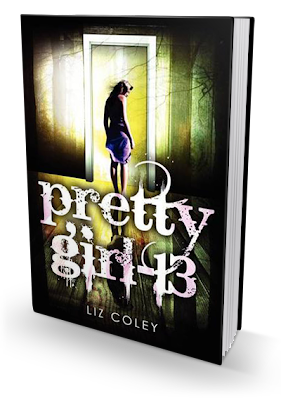 In Liz Coley's alarming and fascinating psychological mystery, sixteen-year-old Angie Chapman must piece together the story of her kidnapping and abuse. Pretty Girl-13 is a disturbing—and ultimately empowering—page-turner about accepting our whole selves, and the healing power of courage, hope, and love. Best part of this day was the sunrise at 5:05 in the parking lot at school. Sooo red. Katie saved me the seat in the van next to her. Thank you Katie. Livvie was late as usual. Yes, you were. Are. I think her mom was in pj’s still because she didn’t get out of the car to hug her goodbye. No, Liv says. She just didn’t have make-up on. Livvie stop reading over my shoulder. I mean it. Stop! Now! Or I’ll write bad things about you. No, holding the flashlight does not give you the right to read my diary. Liv squished in with us, three on a two seat, and pretended to get carsick on the twisty roads. It wasn’t really that bad. Katie’s mom is a slow driver. Yes she is, Katie and you know it. Sorry. I mean she’s a careful driver. You’re welcome. Now you go away, too. No way. Buddy system. Plus it’s a small tent. And that’s my pencil you’re using. Argh. That was Katie. I have retained control of the pencil! And the flashlight. OMG the pine trees smell amazing. Like Christmas everywhere. And it is so so so beautiful in the mountains. I think I heard an owl. The moon is half full. Katie’s mom gave us the usual buddy-system talk at dinner. We’re a triple buddy, triple safe. Backpacks were crazy heavy, but we shared tent weight three ways. I used moleskin so no blisters. Yes, okay. Almost done. Excuse the scribble. They are bugging me to spill all about Greg and The Kiss (es!). Gotta go. And may I say OUCH! Looong hike in. Everything hurts but camp stew was amazing and s’mores even better. Tomorrow we hike along the crest trail. Cool. Can’t wait. By the way, here's my review of the book. I love the story and plot, although it does sound a little hairy, your review makes me really want to read this. Thanks for the giveaway! It sounds disturbing and wonderful at the same time. These are real issues in our society, it's good to come to terms with them. Thanks for the giveaway. I agree! Real issues! Its good to read realistic stories now and then. This isn't my usual genre, but it does sound awesome! I've heard good things about this so far, and I'm definitely interested in reading it! I think the plot sounds cool. Not my usual read, but I think I'd like it. The plot definitely sounds interesting. It's not the kind of story you see everyday and I would love to read it.